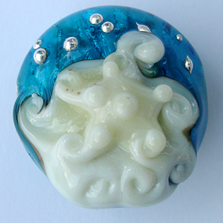 This gorgeous focal bead was designed by me and created using Bullseye glass. The base bead is a tab made of a special production glass cased over pure silver foil. A raised starfish design is tossed by the surf as stars made out of pure silver shine overhead. The hole is horizontal as the bead is shown, however, this bead could also work as a vertically hung pendant. It was created on a 1/16 inch mandrel. This is the bead that is in the December Beadwork. The original bead as shown in the photo is no longer available but I am accepting custom orders. Please be aware that custom orders will differ slightly from the photo. These gorgeous lentils are a wonderful orb or button shape. They are about 22mm from hole-to-hole which makes them a perfect small focal size. 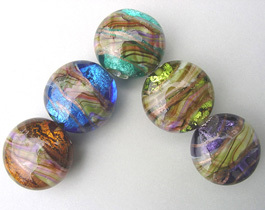 Several of these together would make a spectacular bracelet! The five available colors are shown in the photo. Please choose your color from the drop down. Colors are shown in order from the lower left corner to the lower right corner. These beads are sold individually.